Carnivores can choose grass-fed meat, free-range chicken, and fish for their proteins. The most popular dishes include the fajita del Rey bowl, the Tocaya salad, barrio-style tacos, and the churro waffle ice cream sandwich. The restaurant also serves aguas frescas as well as margaritas, wine, and beer. The 6,000-square-foot restaurant takes up two floors at 755 Fifth Ave. Inside, the restaurant features a mix of wood, stone, and natural fabrics in vibrant fiesta colors. Diners can look into the open kitchen, or sit at the indoor and outdoor patio or in a separate mezzanine area serving as a lounge space. This expansion features The Madera Group’s very first 40-foot living wall filled with succulents that serves as the restaurant’s centerpiece. 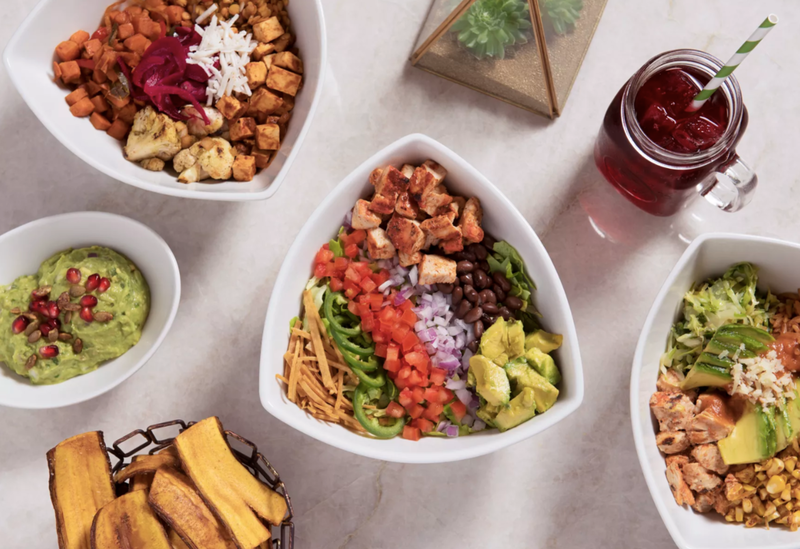 The restaurant is open daily for lunch and dinner from 11:30 a.m. to 10:30 p.m. Tocaya is set to have 14 stores by the end of this year and will be opening in Westfield UTC this year and in North County’s One Paseo in 2019.